For optimal enjoyment, click “play” before you start reading. Unless you can’t read and enjoy music at the same time. In my 10 years of spinning (teaching for about 5-ish), I have found that, after trying class for the first time, the majority of people either LOVE it or HATE it. There aren’t too many people in the middle. The people who hate it complain about how sore their, um, parts are. (That goes away and can be decreased by purchasing padded bike shorts) They also complain about it being “too hard”, or being intimidated by the others in class, or the instructor. Those who love it are inspired by music they like, or an instructor, or just love working different muscles. There are tons more likes and dislikes, but I won’t go on… I will say that if you try a class and you hate it, try it two more times over the next 10 days or so. Often by doing it more than once, the hate feeling turns into just a “Wow, this really can be hard but I’m going to try to get used to it and work at it until I feel more comfortable.” People who give it more than one shot usually adjust to it pretty well. The nice thing about spinning as compared with another cardio class like aerobics or kickboxing is that you are (obviously) on a stationary bike and you won’t fall, and you don’t need to worry about choreography. Also, even if the class is way harder than your current level, in Spin it’s ALWAYS modifiable to whatever your level is. What I always tell new people in my class is, “Please just don’t leave. Whatever you do, even if it seems really hard, just sit and pedal. Try to enjoy being there. Enjoy that you’re making your body move, enjoy the music, enjoy the people in class, whatever you can find that you can enjoy just a little bit, focus on that.” If we are doing a lot of up and down stuff, I advise newbies to try it if they want, but not to get frustrated if they find that standing up is too advanced: just sit back down. Baby steps. Spinning utilizes different muscles from running or aerobics in a different way; that’s why it’s a good class to throw in there as part of cross-training. A good companion for spinning is pilates, because spinning really works your strength and endurance but can tighten you up, and pilates focuses on strength through stretching, which will loosen you up again! Once you’re in class and set up on the bike, just go with the flow. A good instructor will, if they know you’re new, not pressure you to work as hard as everyone else, and a good instructor will definitely not say something like, “Hey Girl in the Yellow Top, stand up like everyone else! Come on!” (If that happens, you should leave immediately, tell management, and then find another instructor.) A good instructor is a good observer. Speaking of that, all instructors are different. They have different personalities and different music. Would I enjoy going to a class that is taught by a quiet instructor who cues very little and plays country music? Absolutely not. But many people do. My Wednesday evening class is NUTS. I adore them. We shout playfully at each other and I crank the music up superloud, and it’s mostly techno, dance, and electronica. And ‘80s tunes for Linda. But my class isn’t for everybody either. Try out a couple of instructors that would fit into your schedule before you make up your mind about if you enjoy spinning or not. Once you find the class/instructor that has the qualities you personally enjoy, you will automatically feel more comfortable. And if you’re ever in the Chicago area on a Wednesday, come and see us! We’re a tight group that expands very easily for newbies, and a Wednesday evening with us just might change your life! I think I covered just about everything, but if anyone has any questions, leave them in the comments section and I’ll answer them! Does anyone ever tell you they get dizzy on their bike? 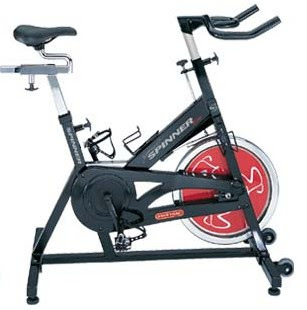 We have a stationary bike, and everytime I ride it, I get dizzy. I wondered if it was the inevitable side to side motion making the fluid in my ears slosh around. Lately…I’ve just been running because I hate the feeling I get on the bike. Hmm. Interesting. I don’t recall anyone ever having that problem; the first thing I thought of when I read that just now is maybe a lack of oxygen or something. Do you get dizzy no matter how hard you’re riding? I’ll have to think about that one. But good for you for running: I HATE to run, but I’m always envious of those who do it because I wish I liked it! Now you make me want to get on my bike. I feel like working out. Right on, well said – you’re so right about finding your fit in regards to music and instructor!!! Dea: We WERE out of control, weren’t we? It was fun though. What a great post. Thanks for the tips. When I ride a bike, invariably my knee ends up killing me, so I don’t think spinning is for me, but I really enjoyed your tips, especially on what makes a good instructor. I think that applies to any kind of exercise class. Now, to find that! I also hate when I go to a new class and the instructor never says a word to me. Not before, during, or after. Never. That’s a horrible feeling. I’ll admit it. It was me that asked the question. And ummm I still have the email that I fully intended on replying to but ummm I’m a touch behind on email and it’s sort of gotten lost in the shuffle. Sorry! It was very helpful info though, and I do greatly appreciate it! And for the person who gets dizzy on the bike, let me know if you figure it out. I’ve started getting dizzy when running — last Friday the first time on a treadmill vs outside and I was hoping it was because I didn’t have it inclined and again today when doing my 25 minute run outside. It’s not a good feeling.